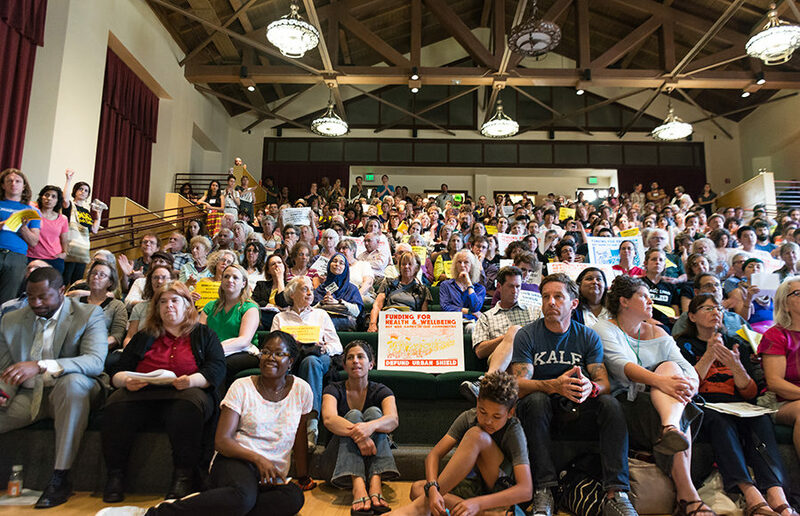 Amid protest from a crowd packed into the Longfellow Middle School auditorium, Berkeley City Council voted Wednesday morning to continue participating in the controversial Urban Shield police training program. Every vote taken at the special meeting — Urban Shield, the Northern California Regional Intelligence Center, or NCRIC, the Bay Area Urban Areas Security Initiative, or UASI, and a grant application for an armored police van — was approved to an increasingly dismayed audience. Upon approval of Urban Shield about 12:30 a.m., the crowd rushed the front of the room in protest. Two protesters were arrested by Berkeley Police Department officers for storming the stage at the end of the meeting. “Stop, stop, stop Urban Shield,” protesters chanted as they unfurled a banner calling to end the “militarization of our communities” on the council dais before marching out of the building. Activists, including members of the Stop Urban Shield Coalition, formed a circle outside the auditorium and stated their intent to continue opposing Urban Shield until the city of Berkeley withdrew entirely. Arreguín noted in his statement that two people inside the auditorium were arrested “on charges of obstructing, delaying, or resisting an officer, and for the obstruction of a Council Meeting,” but “both were cited and released,” citing reports he received from BPD and personal observation. Initially, Arreguín introduced at the meeting a motion to suspend — rather than terminate — Urban Shield involvement until a newly created subcommittee determined how to proceed on the issue. Councilmember Susan Wengraf, however, suggested suspension should not be considered until after Urban Shield training in the fall. City Council voted on and passed the amended item 6-2 — with Councilmembers Kate Harrison and Cheryl Davila voting against — continuing the city’s partnership with Urban Shield. Protesters began rushing the stage before Councilmember Kriss Worthington could announce his vote. The voting occurred after a four-hour, near-universally aligned public comment section against continuation of the programs. 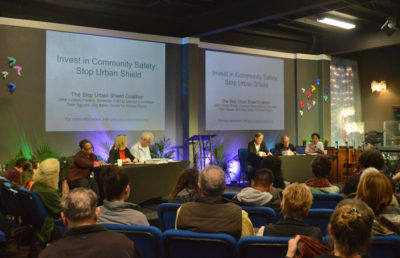 Urban Shield was the particular target of almost all public commenters, many holding signs plastered with the words “Berkeley Resident Against Urban Shield.” Audience members participated in chants led by members of the Stop Urban Shield Coalition throughout the meeting. The training program was repeatedly criticized by speakers for alleged racism and promotion of police militarization. BPD representatives spoke at the meeting in favor of continuing the city’s partnership with Urban Shield. BPD Police Chief Andrew Greenwood argued Urban Shield provides BPD with “invaluable leadership and practical experience” for its officers. 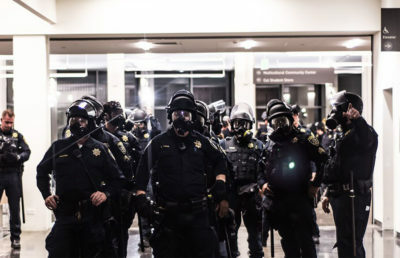 Councilmember Ben Bartlett said his perception of the situation had been altered after experiencing the recent spate of violent protests and rallies in Berkeley over the past year, and expressed support for the Urban Shield training. 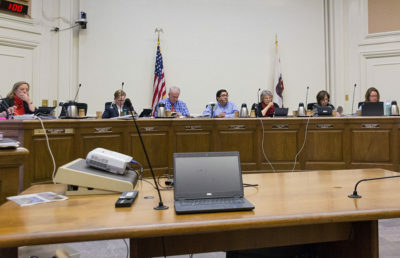 Gus Newport, a former mayor of Berkeley, criticized the council for considering further participation in Urban Shield. Newport urged the council to consider the interests of its people over the police’s analysis. The city’s Urban Shield participation will continue with a training session in September. The new council subcommittee will be in charge of researching Urban Shield and NCRIC. Key tasks for the subcommittee include attending and observing Urban Shield exercises, reviewing Urban Shield scenarios from the past three to five years and gathering feedback from other Northern California jurisdictions who don’t participate in the training, according to the approved item. The decision to suspend or terminate participation in the programs, including Urban Shield, may be made at a future date. Harrison, who voted in opposition to the Urban Shield item and NCRIC, cited potential misuse of power as a critical issue and referenced the police brutality of the 1969 People’s Park protests as evidence. Councilmember Davila voted against every proposed item. At the meeting, Davila called on her colleagues to “show some courage” and “be a fearless city” by ending the city participation in the programs. Edward Booth covers city government. Contact Edward Booth at [email protected] and follow him on Twitter at @Edward_E_Booth.